A running private joke b/w wife and I when attending car shows; we would look at all manner of vehicles and I would ask if it could hold a 4×8 sheet of construction material. 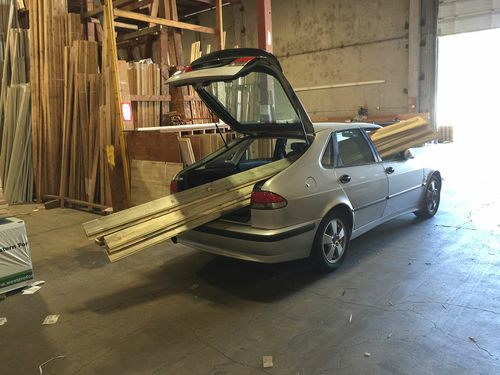 My Saab (see below) did an admirable job with construction materials over the years but it’s 15 years old and it was time for a vehicle with a fresh drive train. I had more or less decided on a Transit and had looked around for a 1-2 year old model. The local dealers only had new ones in stock and were not much on price adjusting which led to looking at Metrises. I found one with 12K miles on the odometer – a much better value than a new Transit/NV200/Promaster. I’m very happy about the construction quality, cargo capacity, acceleration and maneuverability. Not so happy about the blind spots and interior noise, but those are endemic to the vehicle class. The dealer covered 2/3’s of the cost of rear windows which helped but did not completely solve the blind spot issues. The first consideration for addressing the interior noise was to order the interior panels and parts from MB. Ordering the right parts was not DIY friendly and the dealers were not interested in doing that work. I was referred to an aftermarket van conversion shop. Their estimate was past what I was willing to pay. Next was looking at aftermarket panels which would cost $1800 and serve for cover and insulation. Aside from expense, I didn’t like that the panels would cover the threaded holes for attaching shelving/cabinets to the sidewalls. That turned it into a woodworking project. It was fun in a challenging and time consuming way, but not expensive. $350 for plywood, Thinsulate SM600L and panel mounting hardware and tools. The interior is less noisy now, but I’m hoping there is room for improvement in putting an additional layer of matting on the floor and covering the wheelwells. That is the next step in this version of Pimp My Van. Nice. I always wondered about a similar project. Did you think of trying RV parts, repair? I thought they may be of help doing windows and accessories. Here in U,S. the Chrysler Town and Country (now Pacifica from 2017) does admirable job of hauling 4×8 sheets. Stow in floor seats a big plus. Also, it has very low lift height. No back breaking. When not hauling lumber, sheet goods, it is a comfortable family hauler, decent fuel economy. would have added to your total and it’s a bit of a pain to install, but automotive sound deadening would have helped out with the road noise. dustyal- Metris hasn’t been around that long to attract the after-market folks. I’ve been looking for interior wheel-well covers w/o success on-line. The passenger van version of the Metris and others like it- Sienna, Oddysey, Pacifica were much too civilized for my purposes. Also, I needed to bring back some sewing machines that belonged to my mom recently and they would not have fit in that type of vehicle. bndawgs- my first thought was using the stick-on tiles. Once I researched them, realized that the van came with those installed. The van conversion place reassured me that the interior only needed about a third of the interior covered by that product. I’m looking at mass loaded vinyl options to put under the plywood floor the van came with. Cool, that sure is the pimping for a woodworker.